Service Corporation International (SCI), which includes affiliated company Neptune Society, received the J.D. 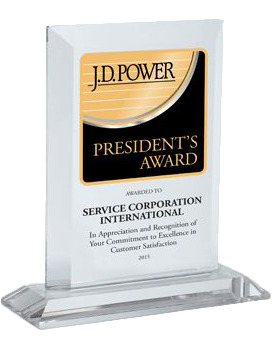 Power President’s Award in 2016. SCI is North America’s largest single provider of funeral, cremation, and cemetery services. It is one of only 12 companies to ever be bestowed this prestigious customer service award. SCI has partnered with J.D. Power over the last ten years to administer a robust questionnaire, surveying over one hundred thousand families each year. The survey elicits insightful feedback on how SCI has impacted its customers’ lives. SCI has consistently scored very high. SCI is dedicated to compassionately supporting families at difficult times, celebrating the significance of lives that have been lived, and preserving memories that transcend generations, with dignity and honor.